I’m not entirely sure how it came to be that I hadn’t left the country in as much as 8 years. I had been extremely fortunate with visa situations and never needed to do a border run but I decided to travel home for a short holiday, and so the process started of preparing to exit Thailand and return a couple of weeks later. The first thing that I needed to do and something that is forgotten by many expats to their later dismay is to obtain a re-entry stamp at immigration. This allows you to re-enter Thailand on the same visa extension such as business or retirement which you had when you left the country. You just need 2 passport photos, the completed form and the processing fee. The re-entry permit costs 1000 baht for a single entry and 3,800 baht for multiple entries and the stamp is valid as long as your current extension is valid. 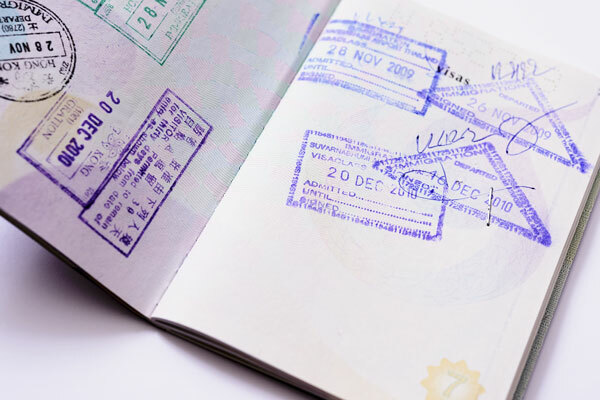 When you renew your visa you need to also obtain a re-entry stamp as the old one will be null and void. Don’t forget to sort out some travel insurance as even if you have health care in your home country, if you’re a non-resident and not registered with a Doctor, it will be much less hassle to have a travel insurance policy in place than to try and prove your entitlement to free care. A week long policy from a company such as Bupa costs around 1500 baht. So, with a valid re-entry stamp and a travel insurance policy, off I went to Suvarnabhumi Airport to start my journey and the exit process. Even when using a domestic flight you need to complete the tedious process of removing laptops or electrical devices from your hand luggage as it is scanned. In these situations I always seem to be the only person who worries about their stuff going missing. My bag with my passport, my phone and my money is disappearing into a black hole and I’m being shouted at to ‘go back and take my shoes off’ – I always find it a little unnerving. I guess that I should mention at this point, that my departure card was in a pretty sorry state and the original writing could barely be read. To add to the confusion, I have since renewed my British Passport last year and the only reference to my original entrance to Thailand was a stamp stating ‘Entered on Feb 2008 – Visa Class, Non O valid until 5th May 2008. Of course, there was no evidence of any subsequent extensions or change of visa class apart from the last one and this alone caused quite a stir at the immigration desk. Now, it also seems that a few years ago Thailand introduced bio-metric eye scanning and the officers on duty had not had to allow anyone to exit from the country who hadn’t been through this process on entry for quite some time. However, before I learned any of this, as I was at the Passport Control desk the officer looked at my passport, called a colleague over, handed my passport to him and I was ushered away to a large immigration desk behind the usual control booths right next to the overstay counter. I was told to sit down and wait which I did for about 15 minutes and nothing seemed to be happening. Then I saw the female officer who was dealing with my passport show it to a colleague who started examining it (my departure card I guess) with a large magnifying glass. I have to be honest, at this point I was starting to sweat – even though I knew there was nothing wrong, I had never even considered there being an issue leaving Thailand! By this point I am smiling happily and nodding along with a chorus of “mei bpen rai, it’s no problem, take your time” by the time everything was finished two or three more officers who were just changing their shift had come to join in the conversation with the “kon yoo tee nee nairn laew” – AKA me. Goodbyes were said in an exchange of wai’s, smiles and Chok Dee Ka – good luck! All in all, their service was very friendly and helpful and shows you how staying calm and making an effort to speak Thai can make a big difference to the way foreigners are perceived. Always remember to dress formally when dealing Thai immigration officials, in order to show respect for the ‘officialness’ of their duties and be patient and polite at all times and never question anything which they tell you. So, if you’re leaving the country after a long stay here, be prepared for similar issues as I expect that it will continue to be an issue for which a standard procedure can’t really be created. The main points to remember are: don’t forget your re-entry permit, take out travel insurance and try to keep your departure card in good order.